Heard Island, by far the largest of the group, is a 368-square-kilometre (142 sq mi) bleak and mountainous island located at 53°06′S 73°31′E﻿ / ﻿53.100°S 73.517°E﻿ / -53.100; 73.517. Its mountains are covered by 41 glaciers (the island is 80% covered with ice) and dominated by Mawson Peak, a 2,745-metre-high (9,006 ft) complex volcano which forms part of the Big Ben massif. A July 2000 satellite image from the University of Hawaii's Institute of Geophysics and Planetology (HIGP) Thermal Alert Team showed an active 2-kilometre-long (1.2 mi) and 50- to 90-metre-wide (164–295 ft) lava flow trending south-west from the summit of Big Ben. 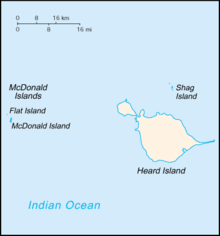 The McDonald Islands are located 44 kilometres (27 mi) to the west of Heard Island at 53°02′20″S 72°36′04″E﻿ / ﻿53.03889°S 72.60111°E﻿ / -53.03889; 72.60111. The islands are small and rocky. In 1980 they consisted of McDonald Island (186 metres (610 ft) high), Flat Island (55 metres (180 ft) high) and Meyer Rock (170 metres (560 ft) high). They totalled approximately 2.5 square kilometres (1.0 sq mi) in area, where McDonald Island was 1.13 square kilometres (0.4 sq mi). There is a small group of islets and rocks about 10 kilometres (6 mi) north of Heard Island, consisting of Shag Islet, Sail Rock, Morgan Island and Black Rock. They total about 1.1 square kilometres (0.4 sq mi) in area. Neither island-cluster had recorded visitors until the mid-1850s. 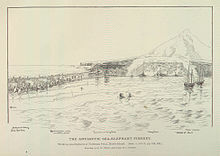 Peter Kemp, a British sailor, may have become the first person to see the island.[which?] 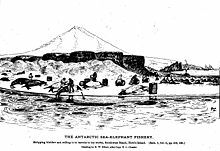 On 27 November 1833, he spotted it from the brig Magnet during a voyage from the Kerguelen Islands to the Antarctic and was believed[by whom?] to have entered the island on his 1833 chart. ^ BirdLife International. (2011). Important Bird Areas factsheet: Heard and McDonald Islands. Downloaded from [www.birdlife.org] on 2011-12-23. 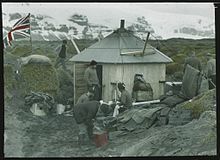 Wikimedia Commons has media related to Heard Island and McDonald Islands. Look up heard island and mcdonald islands in Wiktionary, the free dictionary. Wikivoyage has a travel guide for Heard Island and McDonald Islands.